Is Changing the Constitution the Only Way to Fix Washington? 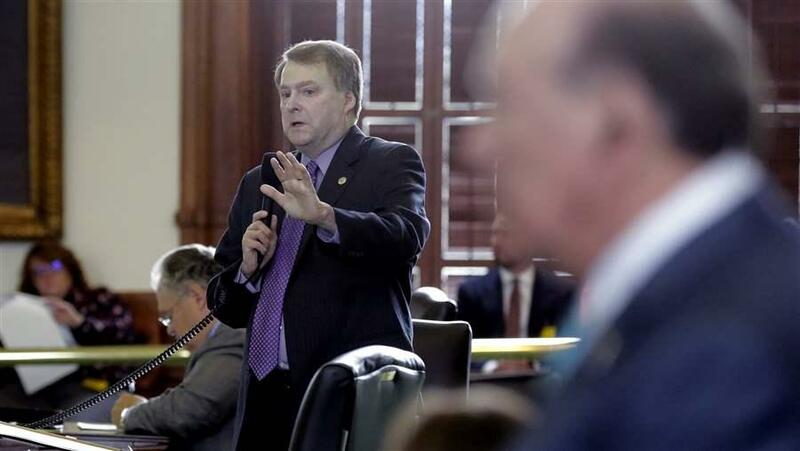 Texas state Sen. Brian Birdwell, a Republican, debates a call for a “convention of states” to amend the U.S. Constitution. Although many amendment topics have been proposed, the most popular one would require the federal government to balance its budget. This story was updated 8/7 to correct the designation of Common Cause. It is a good government group. Next month delegations of state lawmakers will travel to Phoenix, Arizona, to attend what organizers say will be the first formal convention of states since the Civil War. They’ll gather at the capitol, inside the turquoise-carpeted House chamber, and draw up rules for a hoped-for future meeting: a convention to draft an amendment to the U.S. Constitution. No “amendment convention” has taken place since the Constitution was written over 200 years ago. But the idea is gaining steam now, stoked by groups on the left and right that say amendments drafted and ratified by states are the last, best hope for fixing the nation’s broken political system and dysfunctional — some even say tyrannical — federal government. “We have a Congress in the United States made up of two bodies — House and Senate — that are incapable of restricting their own power,” said Texas state Sen. Brian Birdwell, a Republican. With the conventions, he said, states are stepping in to clean up the mess. The current push for a convention began in the early years of the Obama administration, mostly driven by Republican lawmakers. Ohio Gov. John Kasich and Texas Gov. Greg Abbott are big supporters. So are former presidential candidates Sen. Ted Cruz and Sen. Marco Rubio. Although many amendment topics have been proposed, the most popular would require the federal government to balance its budget. Twenty-seven states have passed resolutions in favor of a balanced budget amendment since the 1970s, observers say. The Balanced Budget Amendment Task Force, the main group currently pushing the idea, says it could get to 34 states before the next presidential election. 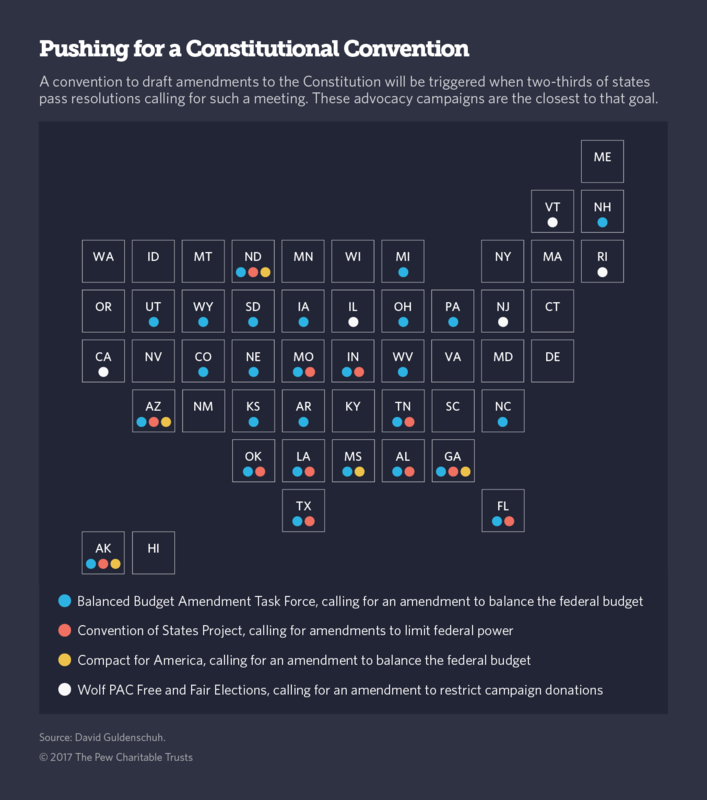 But to get the two-thirds of states required to force Congress to call a convention, the task force and its supporters will need to win over skeptical lawmakers and beat back opposing groups that say a convention called to discuss a single issue could end up rewriting crucial parts of the Constitution or scrapping the nation’s founding document altogether. The two sides don’t even use the same words to discuss what they’re fighting over. Those in favor talk about an “amendment convention,” implying that only one amendment will be discussed. Those opposed say “Constitutional convention,” suggesting that the whole text could be rewritten. The Arizona planning event, championed by Republicans and the Balanced Budget Amendment Task Force, will focus on the balanced budget proposal that’s closest to triggering a convention. David Guldenschuh will be heading to the Arizona meeting this fall as a member of the delegation from Georgia. He’s affiliated with the Heartland Institute, a right-wing think tank, and he advises multiple groups calling for a convention of states. “People are really tired of Washington and don’t believe that our government is accomplishing anything,” he said. Borrowing an applause line from President Donald Trump, Guldenschuh called the frustration he’s seeing the “drain the swamp” concept. Although the 2016 election delivered the U.S. House, Senate and presidency into Republican hands, one-party control hasn’t broken the gridlock. Many conservatives are particularly incensed by Congress’ repeated, failed votes to repeal Obamacare. “The mechanism the founders gave for fixing Washington is Article 5,” Guldenschuh said. Article 5 of the Constitution says Congress “shall call a Convention for proposing Amendments” when two-thirds of states ask it to do so. Proposed amendments would have to be ratified by three-quarters of state legislatures, just like amendments proposed by Congress. Article 5 doesn’t say how delegates would be selected or what they’d be legally empowered to discuss. But supporters say it’s possible to infer what the founders meant by looking at their other writings and the political norms of 18th century America. According to Guldenschuh’s Heartland Institute colleague, Rob Natelson, early conventions of states discussed a single topic that state legislatures defined ahead of time. Most recent state resolutions calling for an amendment convention are inspired by four national advocacy campaigns. The resolutions call for an amendment on a particular topic but don’t endorse any specific amendment language. Twelve states have passed resolutions based on the ideas of the Convention of States Project, a Tea Party-influenced group that wants to reduce federal power over states, according to Guldenschuh’s count. That includes Arizona and Texas, where Townsend and Birdwell, respectively, sponsored successful resolutions this year. Twenty-seven states have passed resolutions affiliated with the Balanced Budget Amendment Task Force — including, this year, Arizona and Wyoming — and five states have passed balanced budget amendment resolutions inspired by Compact for America, which suggests different resolution language. These three campaigns have been helped along by model legislation disseminated by the American Legislative Exchange Council, a membership organization of state legislators who favor limited government. In addition, five states have passed resolutions inspired by Wolf PAC, a left-wing group that wants to limit spending on elections. Hawaii came close to passing a resolution on the topic this year. But many lawmakers — and opposing advocacy groups — worry that a convention could spiral out of control. Nothing in the Constitution says that delegates have to follow the guidelines legislators set out for them. Some legal scholars say that once delegates show up at a convention, they’ll be able to set their own rules and discuss whatever they want — even throw out the Constitution’s existing rules for ratifying amendments. “It’s hard to overstate what the danger is,” said David Super, a professor at Georgetown Law School. 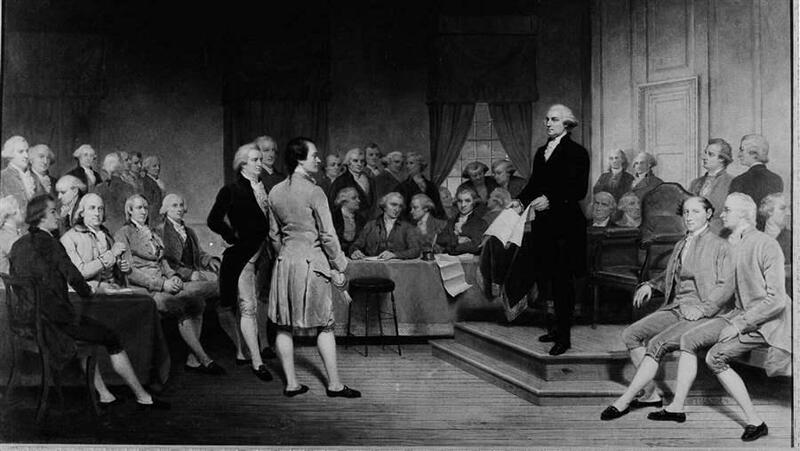 George Washington is depicted in a 1856 painting, “George Washington Addressing the Constitutional Convention,” by Junius Brutus Stearns. At a 2011 conference, Harvard Law School Professor Laurence Tribe listed many of the questions about a convention that Article 5 doesn’t answer. “What kinds of state applications … are required to trigger it? Who sets its rules? How do its proposed changes become binding law?” he asked. It’s unclear what role the Supreme Court could play in clearing up the legal confusion and resolving conflicts between Congress, state governments and delegates. “My guess is that the court would stay a million miles away from all of this,” Tribe said, and leave politicians to fight it out. Opponents of an amendment convention have also been lobbying state lawmakers, citing a competing set of legal arguments. Both sides like to quote the late Supreme Court Justice Antonin Scalia, who over the course of his life spoke out both for and against a convention. “We’re trying to protect the Constitution from being rewritten or changed in ways that would be harmful,” said Larry Greenley, director of missions for the conservative John Birch Society. He said anything could come out of an Article 5 convention, such as a new Second Amendment that would rewrite the nation’s gun laws. This year legislatures in Maryland, New Mexico and Nevada all rescinded old resolutions calling for a convention, fearing that it would lead to a major rewrite of the Constitution driven by Republicans, who control most state legislatures. Now no state legislatures controlled by Democrats have such a resolution on the books, says Jay Riestenberg, a campaign strategist for Common Cause, a good government group. With Trump’s campaign under investigation for colluding with Russia to fix the election, there couldn’t be a worse time for tinkering with the Constitution, Riestenberg says. “We’re [already] inching toward a Constitutional crisis,” he said. To try to limit risk, 12 states have passed laws that dictate the rules for sending delegates to a convention. The bill Birdwell successfully championed in Texas this year was typical: it outlined how delegates would be selected (by the Legislature), the topics they can discuss (chosen by the Legislature), and the oaths of office they’d have to swear (to the Legislature) to prevent them from going rogue. Organizers of the Arizona planning convention say that while its primary purpose is to hash out the rules for an official Article 5 convention, they also hope it will assuage lawmakers’ fears. Although multiple practice conventions have been held before, organized by groups interested in Article 5, the Arizona event will be the first to formally ask every state legislature to send a delegation. Townsend has been to several such mock conventions, starting in 2013, and she told her colleagues in the Arizona House this year that she had left impressed. “Our fellow legislators from around the country were so thoughtful, so intelligent, and so careful,” she said at a committee hearing. Trouble is, if a real convention were to take place, it wouldn’t be attended only by like-minded Article 5 fans. There would be people from blue states and red states with very different opinions on the amendment, the direction the country should go in, and possibly the validity of the convention itself. And there’s a reason why Congress hasn’t made the changes that people pushing for an amendment convention want. Ideas such as requiring a balanced federal budget or limiting campaign donations are controversial and require lawmakers to make difficult choices. Mark Meckler, co-founder of the Convention of States Project, said he expects any convention discussions would take place under tremendous political pressure. Some states could try to block the proceedings and it’s possible that lawmakers would fail to agree on amendment language. “I think the hardest thing is actually getting something out of a convention,” he said. I am not particularly fond of a Convention of the States, or as it has been called a ConCon. However, if there is one there should be three items discussed and only three items: 1) balance budget. Of course the House and Senate have not passed budget in years and years now. 2) Term limits for both the House and Senate. 3) Term limits for the Supreme Court justices or at least an age limit. These are three issues that our Founding Fathers simply could have conceived of when they wrote the Constitution. Our Founding Fathers never dreamed borrowing money at alone that becoming economic slavery for people. They also never dreamed of any one becoming a career politician or people living as long as we do now. May the Lord have mercy.